Me and ten of my friends got together on New Years Eve at my place in San Francisco for a great dinner party. The main attraction: an 11 pound 18-day dry-aged prime standing rib roast, accompanied by an incredible array of creamy sides. 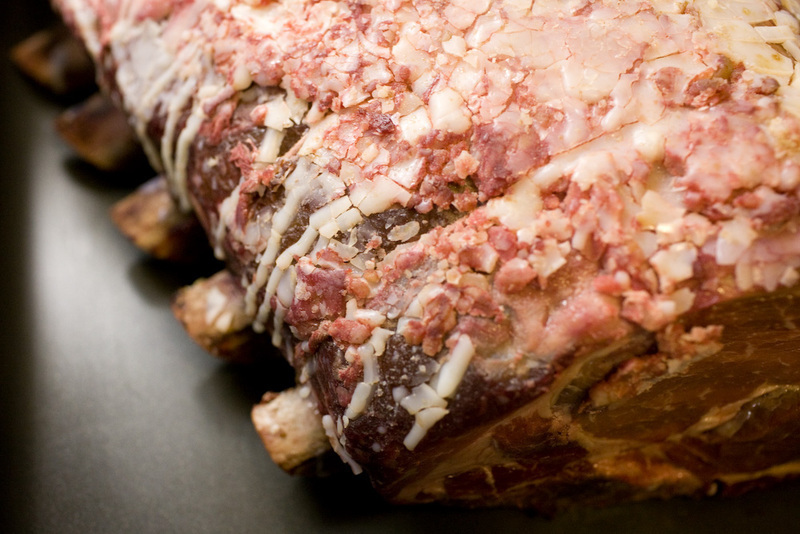 Think House of Prime Rib, but way more high quality because you can control the ingredients 100%. Many thanks to my friends Sushmita, Theo, Molly and Grace for cooking, and for everyone coming out to hang out and celebrate the new year in style. Here are the recipes, courtesy of Tyler Florence's Ultimate cooking show on Food Network. I saw this on Christmas day and was absolutely inspired -- I just had to make it right away! I highly recommend these recipes, and I also highly recommend having great friends come over to help cook, especially if cooking for 11. That first shot is fantastic! it all looks really delicious, great photos!!! — Miriam &amp; Bobby &amp; Friends! yummmyyyy...all sounds so delicious. great shots. happy new year!